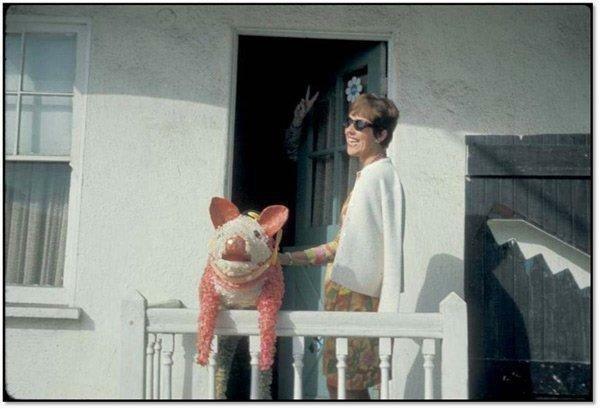 Thomas Pynchon hides from a photographer, placing a pig piñata in his stead. This talk explores two of the twentieth century avant-garde’s most unlikely bedfellows: performance artist Jack Smith and novelist Thomas Pynchon. Paradigmatic examples of maximalist performance and maximalist fiction, Smith and Pynchon show an investment in creating artistic works that explore the possibilities of spectacular self-effacement. Though homophobic structures of the closet and cold war conspiracies create an atmosphere of paranoia for both, neither decide to go completely “off-grid.” Instead, they flirt endlessly with the possibility of disappearance — and in fact do so in the most spectacular way possible. Pynchon may refuse to appear in public or make his whereabouts known, but this refusal has also birthed endless hoaxes and reported sightings. He makes a brief and uncredited cameo in the cinematic adaptation of Inherent Vice (2014) knowing that it will incite inordinate gossip. Smith may have deliberately refused to advertise his performances and he may have been a notoriously guarded (and even hostile) performer, but he was also notoriously camp. He retreats from his audience, but he does so by layering upon his body an excess of colorful and intricately adorned scarves. His face is effaced, though not by a mask — it is effaced by glittery stage makeup. In other words, this talk attempts to untangle — through a discussion of celebrity, paranoia, and maximalist aesthetics — what we mean when we use the seemingly contradictory term “reclusive persona”. By bringing together the cases of Smith and Pynchon, it also hopes to call into question traditional narratives about the insignificance of experimental fiction to American avant-garde theatre. Elizabeth Wiet is a fifth-year PhD candidate in the English department at Yale University whose work focuses on the aesthetics and material conditions of American avant-garde theatre. She is currently completing a dissertation titled Minor Maximalisms: Theatre and the American Novel since 1960, which explores the confluence of experimental theatre and experimental fiction vis-a-vis the aesthetics of maximalism. Her writing has appeared in TDR: The Drama Review.